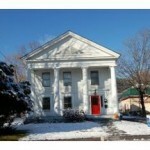 242 Elm Street in Montpelier is one of the most easily recognizable, and beautiful buildings in town. It's the house with the big white columns. It's the house with the great double lot (a half acre!). It stands out, and in a good way. It's also a rock solid investment. Four units, including one of the nicest owner-occupied units around. This main unit, with three bedrooms, has hardwood floors, an upgraded kitchen, and sumptuously preserved historic detail, including a marble hearth and woodwork. The second floor two-bedroom unit has bright hardwood floors, and gets lots of natural light. It's a classy unit, and, like the main unit, gets above market rents (as it should). The remaining two units (one bedroom and two bedroom) allow more opportunity for the next owner to put a personal touch. Don't get me wrong, they're in perfectly good condition, they just aren't at the level of the first two units. I haven't seen very many apartments in Montpelier that are. 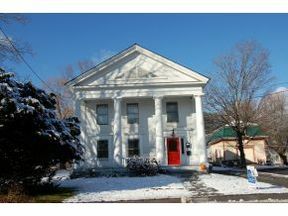 242 Elm Street in Montpelier has one of the keys to investment property in Montpelier--parking. There's a five bay garage that's in great condition, plus a sizeable parking area that allows for snow removal. Housing with off-street parking? What a concept! The back of the building is what would be called a shed. It's attached to the house, but is unfinished space. Two stories of unfinished space with an existing footprint. Could it be a fifth unit? Could it be studio space? Could it be amazing storage? There are lots of options that are worth pursuing. The list of improvements and updates is extensive. Standing seam metal roof and architectural asphalt shingle roof. Updated electric (no knob and tube wiring in this one). Hardwired smoke and carbon monoxide detectors. But one of the best features of the building is something that was done at construction--it's made of solid wood. That's right, it's built like a boat. Wood stacked on top of wood, not framed in. Want to know how such a grand property stays so straight? Solid construction. You've got to see it to really appreciate it.